Around 1941. 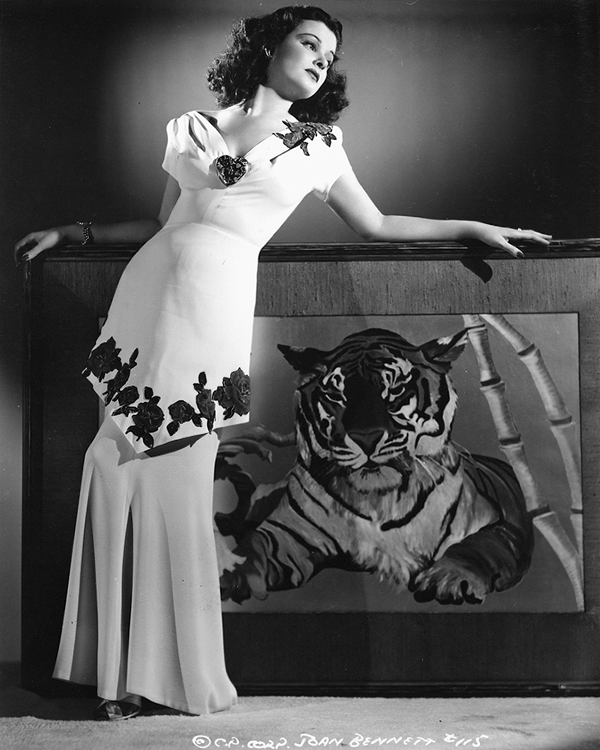 Joan Bennett is entering the second phase of her career. Having played the role of winsome blonde ingenue in movies of the 1930s, she’s now under the wing of celebrated producer Walter Wanger. He also happens to be the third of her four husbands. The couple married in 1940, a couple of years after Walter introduced Hedy Lamarr to American audiences in Algiers. Capitalizing on the success of Hedy’s sultry looks, he has re-cast his wife as a brunette who will star in, among other movies, three Fritz Lang films noirs: as a Cockney prostitute in Man Hunt (1941), as a mysterious model in The Woman in the Window (1944) and as a vulgar blackmailer in Scarlet Street (1946). In 1951, producer Walter Wanger discovered that his wife, Joan Bennett, was having an affair with the agent Jennings Lang. Their encounters were brief and frequent. When Lang and Bennett weren’t meeting clandestinely at vacation spots like New Orleans and the West Indies, they were back in L.A. enjoying weekday quickies at a Beverly Hills apartment otherwise occupied by one of Lang’s underlings at the agency. When Wanger found proof of the affair, he did what any crazed cuckold would do: he shot Lang in the balls. There’s a more detailed account on Wikipedia. Despite the shooting scandal, the couple will remain married until 1965.